On Tuesday 11th June 1667 Mr Henry Walker was by Mr Twetty of Kingston apointed to the cure of Petersham whither he went and tooke possession of the church where he marryed a couple that morning. Mr Walker went to the Hon:ble the Countess of Disart & acquainted her of his being sent by Mr Twitty but she said the right was in her & Mr Walker being allowed by her honour had afterwards licence from my Lord Bishop of Winchester and was confirmed in the place. 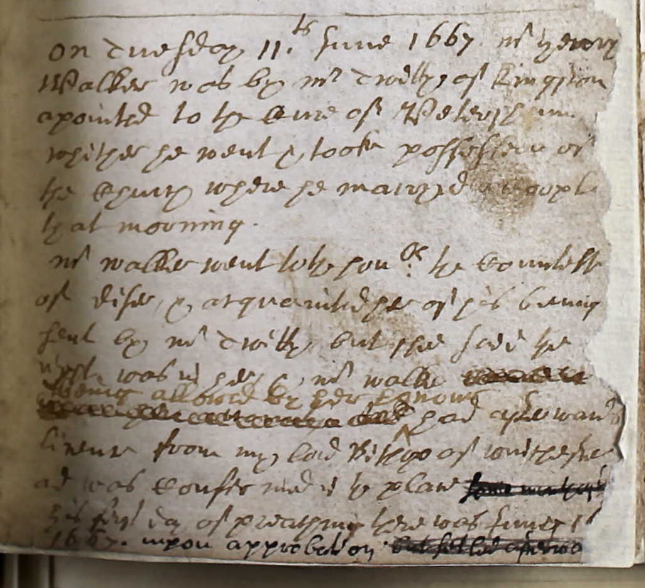 His first day of preaching there was June 1[illegible but must be 6 from the context as 16 June was the Sunday] 1667 upon approbation. I am pretty certain that it was Henry himself who wrote this. 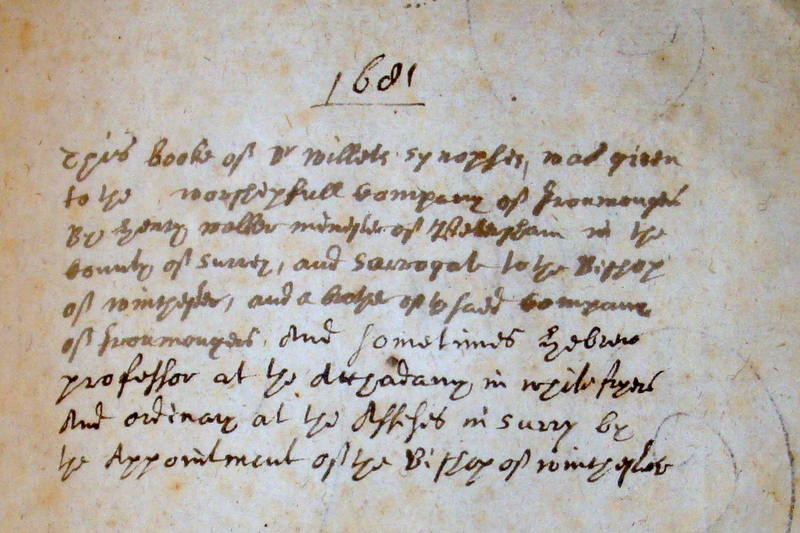 Compare it to this inscription in the flyleaf of a copy of Synopsis Papismi that he gave to the Ironmongers’ Company in 1681, which seems to me to be the same hand. What precedes the entry about the Countess of Dysart seems to be in the same hand. Looking at what has been crossed out – an entry that then is re-written a few places down – it seems most likely that Walker was re-entering material that had already been recorded somewhere else, and made a mistake. The registers are a complete mess, with the pages out of order and the page that would have confirmed Prince Rupert’s alleged marriage of 1664 (together with entries from 1659 to 1664) missing. So Walker may just have been tidying things up. However, one other possibility that occurs to me is whether Walker had effectively taken possession of the curacy himself, some months before he then went to the Countess of Dysart – making this an attempt to rewrite history so as to appear that he had gone to the Countess of Dysart as soon as possible? I have got quite used to Walker’s narrative of his own life being somewhat different to what actually seems to have happened, so would not put it past him, but I would welcome any thoughts. I’ve spent the scattered moments I’ve had for writing in the last week or so trying to make sense of what Henry Walker did during the 1660s. I am not sure I have really succeeded, but here is where I have got to. 1660 marked a sharp turning point in Walker’s career. After spending the 1640s as a mouthpiece for Independent and army grandees, and the 1650s as a state-approved journalist, Charles II’s return to London in May 1660 resulted – as it did for many – in Walker trimming his sails to fit the change of wind. In early August – George Thomason acquired his copy on 6 August – Walker published what would be his last pamphlet: the in no way portentously titled Serious observations lately made, touching his Majesty Charles the Second. The pamphlet had Walker’s usual gimmick of translating an English phrase into Hebrew and then back into a different English phrase. In this case “King Charles Stuart” was transformed into “the King hath prepared a refreshing, hee hath crushed it out of the rock by degrees”. The reference is to Psalm 78, in which God brings forth water from the rocks but the ungrateful Israelites keep sinning. The metaphor is not exactly subtle: Charles II is a latter-day Moses, leading England safely through the wilderness. The pamphlet goes on to compare the thirty-year old Charles to other great thirty-year olds from history such as Joseph, David and even Jesus (a tough act to follow, then). All of which was presumably an attempt by Walker to draw a line under his support for Cromwell and the Council of State, and hence to save his skin. – a Henricus Walker was made curate and preacher of Hanwell in Ealing in April 1661. – a Henricus Walker was made curate of Hounslow chapel, serving Heston and Isleworth, in August 1662 and was still there in 1664. Then on 11 June 1667, a Henry Walker – and this time it is definitely our Henry – was presented to be curate of Petersham chapel near Richmond, by a Mr Twetty of Kingston. This must be Thomas Twitty, who had been made vicar of Kingston in 1662. Shortly afterwards, though, Walker had to pay a call on Elizabeth Tollemache – otherwise known as the Countess of Dysart – who asserted that the living was hers to give rather than Twitty’s. She confirmed his appointment and Walker began preaching there on 16 June. The connection to Elizabeth Tollemache is really intriguing. She was the daughter of William Murray, gentleman of the bedchamber to Charles I who carried messages between Charles and the Scots in 1640. in 1648 she married Sir Lionel Tollemache, and together they supported the Sealed Knot during the 1650s. However, she also seems to have been on good terms with Cromwell (to such an extent that she was alleged to have been his mistress while he was in Scotland). Walker himself was one of Cromwell’s associates – attending his deathbed in 1658, or at least claiming he did. It is just possible that Walker and Elizabeth had known in each other in the 1650s, and that this may have made his hurried visit in June 1667 slightly easier than it would otherwise have been. But again, as with all of Walker’s life in the 1660s, there is no real evidence, only the suggestion of connections. Walker’s handwriting in the Petersham parish register starts at this point, and stops in early 1674. I have only recently found and looked at the original registers and the fact that they contain another physical trace of Walker’s presence – to add the handwritten note I’ve found in the book he donated to the Ironmongers’ Company in 1681, and his signature in their apprentice book in 1629 – has been incredibly exciting. More on that next week. 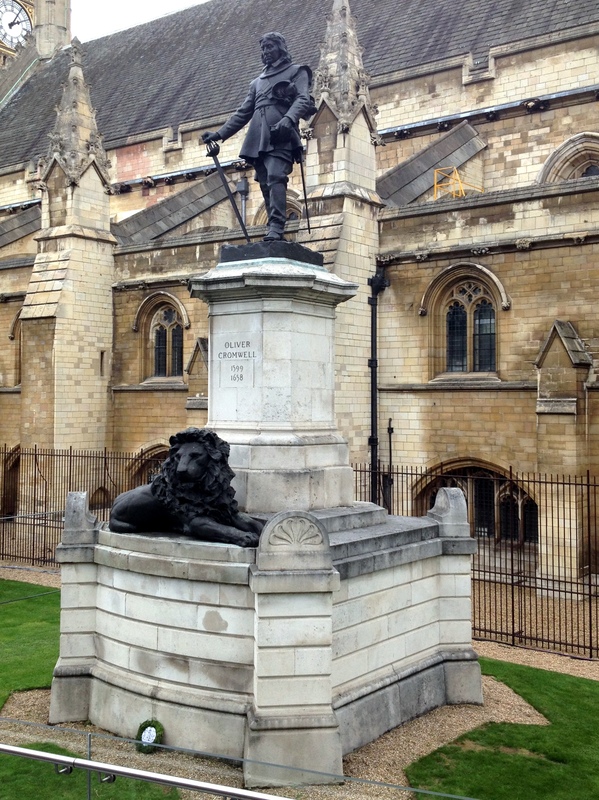 There is, of course, an equal irony that Cromwell – another destroyer of Parliaments – has even greater pride of place outside Westminster Hall. However, while the campaign by Lord Rosebery and others to erect Cromwell’s statue is well-known, the story of Charles’s bust is a bit more obscure. It is there thanks to a campaign by the Society of King Charles the Martyr. In around 1945 the secretary of the Society, Hedley Hope-Nicholson, found two lead busts of the king in a Fulham salvage yard. 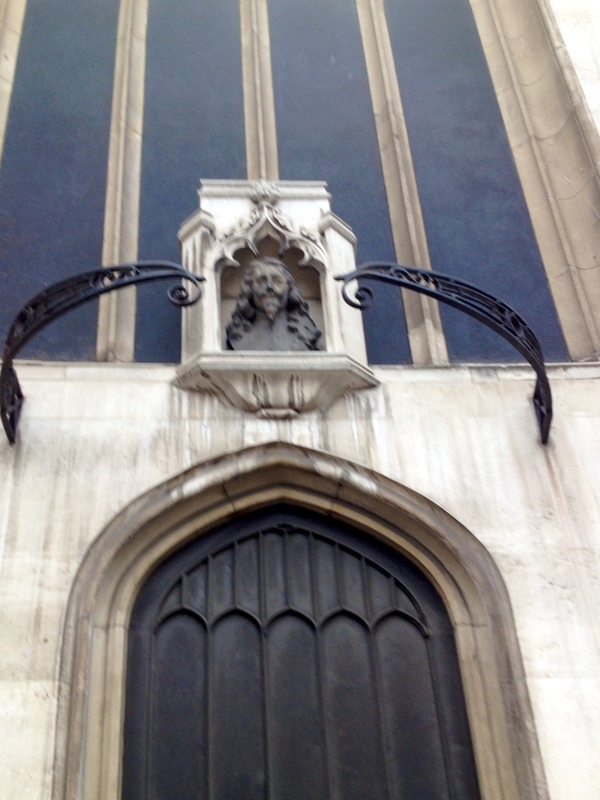 He donated one to the church in 1950; the other is now at the Banqueting House. The gift to St Margaret’s was finally erected in 1956 after a new niche was made for it. I would love to know more about how the decision to install the bust was made, but can find frustratingly little about it other than a note by the Assistant Keeper of the Muniments at the Abbey Library. However, reading between the lines I wonder if its origins may lie in the politics of the rector of the time. The Rector of St Margaret’s in 1956 was the Revd. Canon Charles Smyth. It’s not clear whether he was directly responsible for accepting the gift of the bust and arranging for its placement – but he certainly gave a lecture welcoming its donation. He had read history at Corpus Christi College, Cambridge, before taking holy orders and eventually returning to be Dean of Corpus. As a don he reacted against left-wing orthodoxies and argued that the Anglican clergy could play a superior role to intellectuals as a bearer of truth. In the words of the historian Maurice Cowling – who was not just taught but heavily influenced by him – Smyth was a “destructive intellectual” and “Anglican reactionary” whose primary mode of intellectual inquiry was attack. As a result he never made it as far as a bishopric, despite landing the plum role of rector of St Margaret’s (even quarreling with his neighbours at Westminster School about the noise made by the boys). With this disdain for liberal values, it is not hard to imagine Smyth taking some pleasure at the idea of Charles facing out across Millbank towards Cromwell. His pupil Cowling certainly indulged in mischief-making – or “genial malice”, as he put it – in order to bait what he saw as dogmatic intellectual arrogance masquerading as altruism, on both the left and the right. AT Peterhouse, where he was a Fellow, he founded a dining club called the Authenticators to commemorate Hugh Trevor-Roper’s mistaken authentication of the “Hitler Diaries”. The fact that Trevor-Roper was Master of the college did not deter him. Cowling retired from his Fellowship in 1993, five years before I went up to Peterhouse, but he was still spoken of in hushed tones by graduate students who remembered him. Cowling devoted a significant chunk of the first volume of his Religion and Public Doctrine in Modern England to assessing Smyth’s ideas and political thought, in a chapter which is as much autobiographical confession as historical argument. There is something in Cowling’s epitaph for him – “Smyth challenged nearly everyone and nearly everyone responded” – that suggests Cowling himself would be quite proud of this verdict. It may just be that the genial malice of Cowling’s character was something, like his Conservative polemic, that he first learned from Smyth. This is all speculation, clearly. But I do like the idea of Charles’s statue being a barbed intellectual joke as well as a grand statement of political and religious values. In the Old Testament, God creates the material world by speaking. In Parliament, by contrast, the act of creation is dependent on reading. This may seem a strange assertion, given that the majority of what happens in the Commons and Lords involves speaking: whether that is maiden speeches by new MPs, the back and forth of Prime Minister’s questions, speeches for and against crucial votes, or cross-examination of witnesses in Select Committees. But it was a point that struck me a few months ago while sat watching the Commons debating a Bill. To begin its passage through each House, the House has to agree that the Bill “be read a first time”. Before a Bill can proceed to line-by-line scrutiny, it has to be read a second time. And to pass from one House to the other, a Bill has to be read a third and final time. First Reading is a formality, without a vote, but Second and Third Reading most definitely are not. If either declines to give a Bill its Second Reading, it falls: likewise with Third Reading. While rare, such refusals can happen. In the Commons, Thatcher’s Shops Bill was lost at Second Reading in 1986, and in 1977 Callaghan’s Local Authority Works (Scotland) Bill was defeated at Third Reading. More recently, in 1990 the Lords refused to give a second reading to the War Crimes Bill, and in 1999 did the same with an attempt to equalise the age of consent. So reading is what brings laws to life, and the absence of reading is what prevents them from being born. The actual words of a Bill may technically have been drafted by lawyers, but as a text it does not exist until each House has read it. This should not be a surprise: book historians are well-used to conceiving of individual readers as engaged in a creative act. The author, if not dead, is nonetheless not the only person who creates meaning within texts. And yet I am not aware of anything that has been written about institutions carrying out similar acts of creativity through reading. Parliament is certainly not the only institution which does so: the Church of England reads banns to ensure a marriage is valid, the Riot Act 1715 had to be read by magistrates before protestors could be required to disperse, and royal proclamations binding a monarch’s subjects were publicly announced in order to bring them into force. Paradoxically, what Parliament considers reading is not what most people would recognise as reading. First Reading consists simply of the clerk reading out the short title of the Bill, at which point a Minister stands up and nods. The Bill is then deemed to have been read a first time. Second and Third Reading are set-piece debates that mark the start and the end of a House scrutinising a Bill, and do not even involve the title being read out. Instead the House votes on a motion that the Bill be read a Second or Third time: if this is passed, then the Bill is deemed to have been read and can move to its next stage. There is another in the upper house called the clerke of the parlement, whose office is to read the billes. For everie thing that commeth in consultation in either House, is first put in writing in paper, which being read, he that listeth riseth up and speaketh either with it or against it. The accuracy with which MPs’ diaries record the contents of Bills after First Reading debates, despite the slim chances of actually having scrutinised the manuscript version, confirms that Bills (or at least a summary of them) must have been read out. 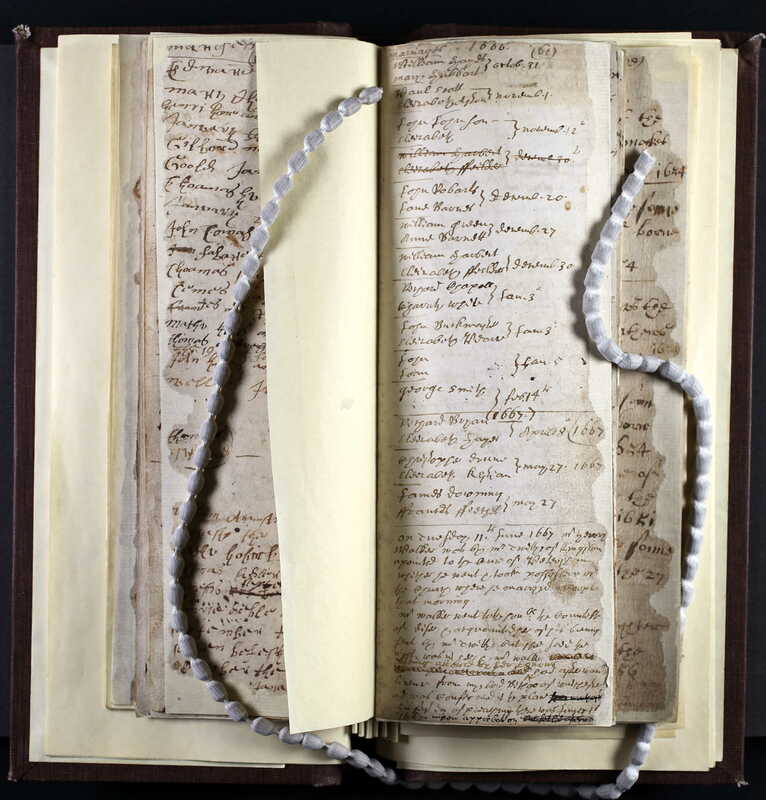 By the second half of the sixteenth century a practice had evolved of producing a “breviate” of the Bill: a brief summary prepared either by the proposer or the Speaker that was a forerunner of today’s explanatory note. Sir Robert Pye began to speak to the bill but he was told it was not to be spoken unto upon the first reading but after the second reading, and so he sat down. Then was read a bill about the assembling of a Parliament yearly though the King did not assemble it by writ. (This I misliked but did forbear to speak against it until the second reading). I beg to move, that the Bill be read a Second/Third time. It may simply be down to the persistence of tradition that First, Second and Third Reading have survived. But I wonder if there is also something about the constitutive power of reading, as MPs, peers and the rest of us experience at a personal level, that has also contributed to it surviving at an institutional level. This post is my first in a very long time, and is (I hope) the start of a return to blogging slightly more regularly. It was inspired by a conversation with @njstevenson, whose own blog I thoroughly recommend. Imagine that you are a peer in the House of Lords. Another peer stands up in the chamber and says something that you feel is inappropriate. What do you do? If this was the House of Commons, the Speaker would judge whether what was said was out of order, and intervene if it was. However, the House of Lords is self-regulating. There is no concept of “out of order” (the equivalent phrase is “undesirable”), and the Lords Speaker has no power to judge what is undesirable or to take action as a result. Instead this is the responsibility of the entire House. So as an offended peer, it is up to you to draw the House’s attention to what has been said, and to use the right procedures to deal with it. If you are both offended and well-versed in parliamentary procedure, then you will remember the House’s Standing Order on Asperity of Speech. That an Accident happened at that Committee, of some Sharpness of Speech between two Lords; which the Committee thought fit to be reported to the House, that an Order might be settled, to avoid all Asperity of Speech at Committees hereafter. The House thought it not fit to have the Words related, or the Lords named between whom they past; but referred it to the Lords Sub-committees for Privileges to set down an Order to prevent the like hereafter. It is worth noting, though, that the Committee was considering Charles I’s requests for new supply amidst calls in the Commons for the duke of Buckingham to be impeached – and that Charles had alienated much of the Commons and the Lords in doing so. Whichever two peers were quarreling, it came only a few days before Charles dissolved Parliament altogether, so ‘sharpness of speech’ is probably a rather muted description of what was said. To prevent misunderstanding, and for avoiding of offensive speeches, when matters are debating, either in the House or at Committees, it is for honour sake thought fit, and so ordered, That all personal, sharp, or taxing speeches be forborn, and whosoever answereth another man’s speech shall apply his answer to the matter without wrong to the person: and as nothing offensive is to be spoken, so nothing is to be ill taken, if the party that speaks it shall presently make a fair exposition or clear denial of the words that might bear any ill construction; and if any offence be given in that kind, as the House itself will be very sensible thereof, so it will sharply censure the offender, and give the party offended a fit reparation and a full satisfaction. In other words, clarify what you said or take it back and apologise. Note that you should not actually stand up and read this standing order. You have to move that the order be read by the clerk, and this motion is debatable. It’s this debate that gives you your chance to challenge the offending peer. It is, however, a nuclear option to be used with care: as far as I can tell, there have only been five times in the last 200 years or so at which it has been debated. I am not unwilling to withdraw the word ‘impertinent;’ but I must say it was not pertinent. Having used the strongest and most offensive expression that could be used—one that would not be permitted in any private society of gentlemen—I ask your Lordships is it becoming to use it in your Lordships House? I hope the noble Earl will not hesitate to state that he withdraws the word “impertinent,” as applied to anything I said, and which I submit he is called upon to do. Noble Lords opposite are so accustomed to have their own way in matters of this sort, that they cannot conceive any course being taken except for us to vote and be beaten on every Amendment they propose. In a burst of petulant discontent, they tore the Ballot Bill to fragments, and then, excited by their achievement, danced a war dance over its remains, flourishing their tomahawks at each other, till Lord Clanricarde, of all human beings, was obliged to recall them to decorum and sense by asking the Clerk to read a sort of private Riot Act, which the Peers, it would seem, keep up to prevent themselves from becoming too disorderly. That this House, ever jealously regarding the Privilege of Parliament, is no less zealous to provide against its abuse, and regrets that the Lord Vansittart, in the speech which he made in this House on March 29 last, did not use due care in the exercise of the Privilege of Parliament. I am not a lawyer, but I cannot imagine a grosser criminal libel against any man. Yet we are asked (for we are all judges—we are all sitting Speaker to-day) to give the privilege of Parliament to the noble Lord in the use of words of that kind against a man with whose political opinions and beliefs most of us in this House disagree. The fact of the matter is that if you disagree with the noble Lord you must expect some epithets quite soon, and the fact that they may be mutually contradictory epithets does not matter. I should like to end by suggesting that before he next selects his epithets, the noble Lord should ask himself rather carefully whether they do not come under the ban of the Ninth Commandment. Well, the noble Viscount has come out and called me, in the most ostentatious manner, the equivalent of a liar. I shall, of course, retort to that by saying that by so doing he has taken his ticket and labelled himself as a fellow passenger of fellow-travellers. There is no Speaker. We rule ourselves. We rule by the good will and common consent of every individual Peer, and we have no other rule. I think that that is one of the reasons why the debates of this House are so highly esteemed. Therefore the careful refraining from any misuse of our privileges is, I think, a stern duty that falls upon every one of us… With the greatest possible respect to my noble friend Viscount Stansgate, whom I have known and loved for forty years, I am going to ask him not to press his Motion. I want this House to shut this business down. My Lords, we Nonconformists have a hymn: Dare to be a Daniel, dare to stand alone. That is what I propose to do. The House then divided on the question of whether Viscount Stansgate’s motion should be put, but a majority disagreed – so neither Stansgate’s motion nor the standing order were agreed or read. The last time the order was actually read was in 1998, during a debate on the Teaching and Higher Education Bill. Amongst other things, this Bill established the current system of student loans. Lord Whitty, the Government Whip leading the Bill in the Lords, accused a number of peers of hypocrisy in purporting to represent students’ views. The Earl Russell – appropriately enough, given his life outside the Lords as a historian of the seventeenth century – moved that the order be read. On this occasion it wasn’t debated but immediately pushed to a division, which was passed by 169 votes to 98. The clerk then read the order. Immediately afterwards, Lord Richard – who was the Leader of the House – suggested that the House adjourn for a short break. This is the Parliamentary equivalent of a pub landlord saying “come on mate, you’ve had a good night but it’s time to go home”. When proceedings resumed, Lord Whitty clarified that he had not intended any personal attack by what he had said, and the House got on with the business before it. The Perne and Ward Libraries is a new blog about the libraries at Peterhouse, Cambridge. The Perne is one of the secret wonders of Cambridge. Based around the bequest left to the college by Andrew Perne, Master of Peterhouse from 1553 to 1589, it contains many other early modern books too, making around four thousand volumes in all. The books are housed in beautiful seventeenth-century shelving and furniture: to see quite how stunning the library is, read my previous post about the Perne here. The Ward, apart from being where I spent every waking hour between March and May of 2001 frantically cramming for my finals, is Peterhouse’s undergraduate library, housed in Cambridge’s former Museum of Classical Archaeology. The first post is about Richard Crashaw, metaphysical poet and fellow of Peterhouse from 1637 until he was ejected in 1644.